Dedicated to the Hindu god Vishnu, Changu Narayan Temple sits on a ridge overlooking the Kathmandu Valley. Believed to be 1,600 years old, it's one of the oldest and most impressive examples of pagoda architecture in Nepal. The complex is a UNESCO World Heritage Site known for its incredible woodcarvings, metal inscriptions, and stone statues adorning the courtyard, all dating from between the 5th and 13th centuries. The complex is located on a high hilltop and surrounded by a forest and a small village called Changu. The views from the top are spectacular on a clear day and there are various shrines and sculptures in the extensive temple grounds, as well as vendors and artisans who offer comparatively well-priced and crafted souvenirs. The temple is a deservedly popular attraction but its location just outside of the city ensures it's not too crowded. 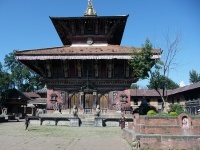 There is an information centre at the entrance to Changu where tickets are issued and information about the temple and wider area is available. Those wanting refreshments will find a number of cafes and restaurants near the temple.